In this Article, we will learn How to Insert, Update and Delete Record in DataGridView in C# Windows Form Application. 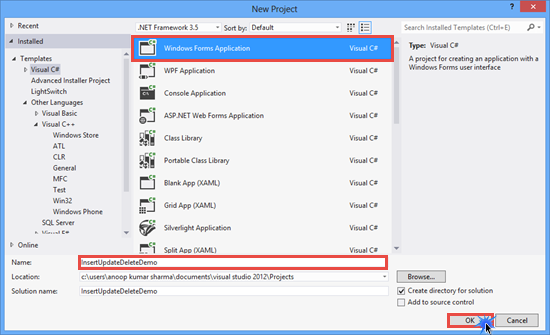 In Previous Post, we saw How to Create a simple Windows Form Login Application in C#. 2. Create a Database (named as Sample). Add a Table tbl_Record. The following is the table schema for creating tbl_Record. 3. 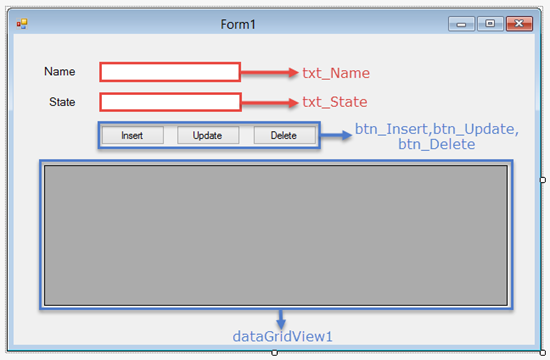 Create a form(named frmMain) and Drop Label, TextBox, Button and DataGridView control from the ToolBox. Now, Go to frmMain.cs code and add System.Data and System.Data.SqlClient namespace. In the above code, I have created dataGridView1_RowHeaderMouseClick Event for updating and deleting the selected Record. When user click on the Row Header of any row then data present in the cell of the row is stored into the TextBoxes. DisplayData() method used to fill data in DataGridView. Clear() method clears the data present TextBox as well as in ID(int) variable. Can you please, create a procedure to insert a image to SQLExpress database using C#? Thanks in advance. Thanks for your comment. I will post an Article on this topic within a week. i want crud operation by using checkbox and radiobuttons. Great Article. You Saved My Time. Please How to Find Error??? In your project it works fine, but when I copy the form contents to another form the event dont work. How can I overcome this situation?